We’re trying something new. 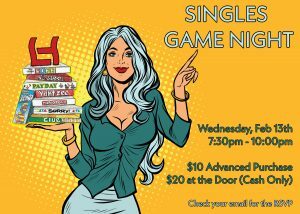 Join us for a Singles Game Night at Liberty Harbor. Play some games, start a conversation, and meet some of your neighbors. We will have light fare and drinks at this fun, low key event. All single LH residents +21 are welcome. You may bring a +1, but only if they are single too! Bring your own games, but we’ll have a variety to choose from too, including classics like Scrabble, Jenga and traditional playing cards, to party games like Cards Against Humanity, That’s What She Said, and What do you Meme. Please note that pre-registration is requested. We may turn you away at the door. To avoid being turned away, please pre-register. $20 at the door (cash only)- we will reserve the right to decline entry. Admission includes light fare and drinks, while supplies last.